To escape, a player needs to reveal face-down cards in front of them that show the equipment showing on the dice, plus runaway cards whose totals equal or exceed the runaway dice score plus the number of surveillance points the player currently has (which I’ll explain in a moment). If they meet or exceed the requirements one of their POWs escapes, the alarm is raised and roll call takes place. During roll call, most cards in your hand are a bad thing as this is equipment you’ve been caught with (which have values 0-4) and cards face-down in front of you count as zero. However, there is one type of card which is the opposite to this (worth zero in hand but 4 points when face-down). All players add up the surveillance totals of cards they’ve been caught with and all players who did not escape that round subtract 3 points for each POW still inside the camp. Players then gain (or lose if negative) that many surveillance points. The more surveillance points you have, the more runaway total you need to escape. Stalag 17 is a very simple game but, unfortunately, that’s its problem – it’s too simple so there aren’t any real decisions to make and little tension. 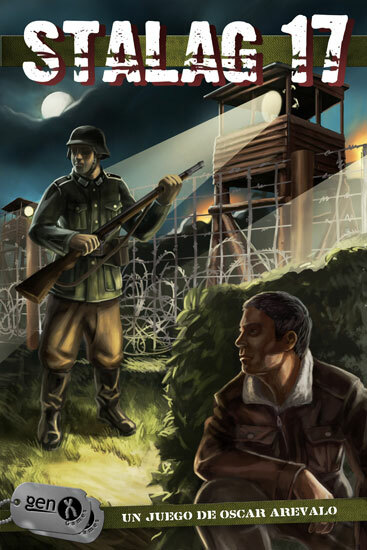 I can see what gameplay Stalag 17 is trying to achieve – Do you think another player is about to escape so you should try to ditch cards from your hand? Is it worth taking 2 cards at a time to maximise finding useful ones, or to progress slower so you don’t have too many in hand? Should you escape now with a high amount of surveillance points in hand, or get rid of some first but risking another player escaping before you? However, this gameplay doesn’t materialise for two core reasons. First, you have almost no information about whether other players are near to escape or not, so there’s nothing to help inform your decisions. You can see how many cards they have face-down but that doesn’t tell you much – just if they have enough cards for it to be possible. Second, the luck of the card draw totally outweighs any control you have – if you don’t draw the cards that contribute towards the escape requirements, there’s nothing you can do to improve your chances of escape. Also, there’s almost nothing you can do to help you discard cards too – you can choose to collect various cards to try and discard multiples but you can’t plan because it’s all on the luck of the draw. Random card drawing is fine in games but only if you then have different ways to utilise the cards. As a result, you don’t really have any decisions to make that are interesting enough and the game feels more like a solo race over which you have little control. One of the cards (counts as any piece of equipment but scores 4 points if laid down and zero points in hand) does have a decision to it because it’s a useful card to have face-down but is a penalty if you don’t escape. Sadly, this is the only card like that and the others are straightforwards – having them face-down is best. As more prisoners escape, more dice are added to the escape plan requirements. However, as you don’t gain any abilities during the game, this just makes later rounds the same but they take longer. Physically, the artwork is decent and the finish on the cards is nice, but I do find the cards a bit floppy and the dice a bit grubby looking. Also, the ratio of box to game components is disappointing as they could have fitted in a box 1/4 the size with room to spare. I’m fine with publishers wanting shelf presence, but there’s a limit and it just means it takes up a lot of room on my shelves for no reason. I’ve seen that there are some extra rules have been released in Spanish. Using Google translator I got a basic understanding of them; for example, one rule lets an extra player escape with another player, another lets a player be an informant once per game allowing them to discard surveillance points rather than free a POW when escaping, etc. However, I can’t see any of the new rules fixing the issues I have with the game. There seem to be lots of ways Stalag 17 could have offered more decisions and player control. When playing, I wanted to be able to use my cards in multiple ways (like spend cards to alter a dice roll, or use sets of cards as other cards, or require sets of cards (pairs, etc.) to escape rather than specific values). I thought it might be fun to have to announce you’re escaping next turn giving players a warning, but you may be bluffing (for which you got a penalty) but also may have humorously caused other players to ditch cards they now still need. I wanted to see more information about players’ cards so I could make more informed decisions even if at the cost of an action. In the end, it’s a shame as Stalag 17’s premise sounds like it could be a tense, push-your-luck filler and the publisher has released good games. 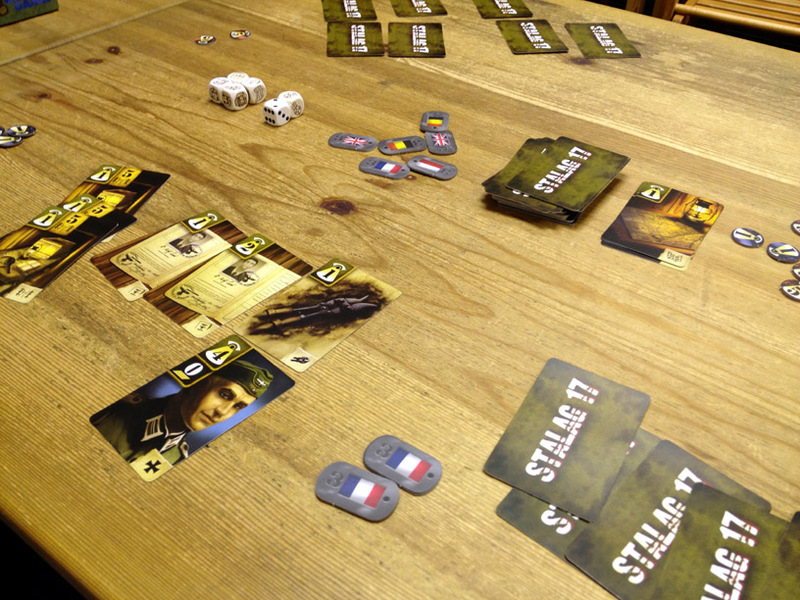 I like Stalag 17’s theme but it just doesn’t have enough gameplay or tension even for a light game for me, and both groups I have played it with felt similarly. I like light filler games and card games so long as I have some decisions to make so I am playing the game, not it playing without me. This entry was posted on Tuesday, November 22nd, 2011 at 3:00 pm	and is filed under Board Game Review, Board Games, Essen Spiel 11, Stalag 17. You can follow any responses to this entry through the RSS 2.0 feed. You can leave a response, or trackback from your own site.